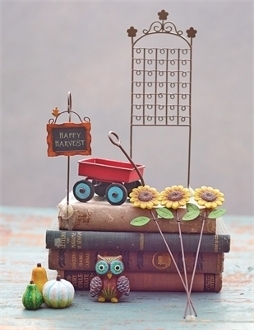 Full Description: This gift-boxed kit includes a mini floral swirl gate, a set of 3 sunflowers, a wagon, a set of 3 gourds, an owl, and a harvest sign. Each kit box includes a card explaining how to plant a mini garden. Items in this kit are also sold seperately.